The Buckeye is a dual purpose breed and as its name implies, it heralds from the State of Ohio originating sometime before 1896. It is the only American breed with a pea-comb. The Buckeye also has the distinction of being the only breed of chicken created entirely by a woman, Mrs. Nettie Metcalf in Warren, Ohio. It was admitted to the American Poultry Association’s (APA) Standard of Perfection in 1904. Mrs. Metcalf’s Red Fowl creation pre-dates the introduction of the Rhode Island Red to her Mid-Western area. Mrs. Metcalf set out to create a large red fowl. She began by first crossing a Buff Cochin male to Barred Plymouth Rock females. She then crossed the half Cochin pullets with a Black Breasted Red Game male she acquired the next year, probably of Oriental ancestry and genetically Wheaten or dark Wheaten in color. She took the red offspring of this mating to create the breed. The Buckeye is a even shade of rich mahogany bay in color. Its feathering is tight much like the other breeds in the APA’s American Class of birds. The Buckeye has a distinctive slate colored bar in the under-color of its back. This bar of slate under-color was meant to enhance and deepen the outer mahogany bay. The mahogany bay covers the entire body of the Buckeye with the exception of the unexposed primaries and secondary wing feathers and the tail feathers which may contain black. Reddish medium size eyes set on a face that has a “bold expression” on a well arched neck, its head “well-up.” The Buckeye’s yellow beak is short and shaded with a reddish horn. The Buckeye’s muscular thighs and wings are situated on a body with a long broad back throughout its length. This is coupled with equally broad and deep rounded breasts which are carried above the horizontal giving the bird an almost square-like appearance. The Buckeye has yellow legs. The Buckeye also appears heavy and full. This appearance is not deceiving as the Buckeye Rooster weighs in at a hefty 9 pounds and the Buckeye Hen at 6.5 pounds. Because of this appearance, many mistakenly believe the Buckeye has Cornish in its background, but the Buckeye was not created using any Cornish blood. Mrs. Metcalf only desired to attain the appearance of the Cornish as it appeared around 1905, which is radically different from the Cornish of today. The Buckeye is an extremely active fowl. Indeed, it has been called the most active of the American breeds. This high level of activity is not without purpose as the Buckeye is highly admired and regarded for their excellent foraging habits. The Buckeye will actually stalk, hunt and pounce on mice with some describing them as almost catlike in this ability. However, the Buckeye does not tolerate confinement as well as some other breeds. The Buckeye overall is also one of the hardiest breeds. Due to their medium size pea comb that is “set closely on the head,” they are especially touted for their cold hardiness. The Buckeye is moderate to slow to mature but is known as producing a very good meat carcass of mostly dark, rich meat with a whiter than usual white meat. 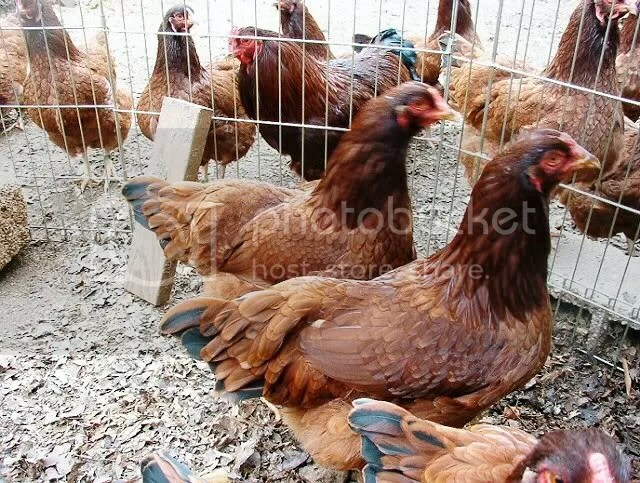 The Buckeye Hen is also a good layer and is known to even surpass the non-production Rhode Island Red Hen. The Buckeye Hen is also capable of going broody. She lays a large, brown egg. Although is has been referred to as a “Sporty Rhode Island Red,” the Rhode Island Red was not used in the Buckeye’s creation. Upon hearing about the Rhode Island Red’s on the East Coast of the United States in 1896, Mrs. Metcalf decided to call her creation, at first, the “Pea-Comb Rhode Island Red.” She even traded some stock with early Rhode Island Red Breeders. Many poultry enthusiasts widely believe the Buckeye to be some version of the Rhode Island Red. This is not true. As has been mentioned previously, the Rhode Island Red was not used in the creation of the Buckeye. Although some true pea comb Rhode Island Reds no doubt instantly became Buckeyes upon Mrs. Metcalf’s re-designation and the Rhode Island Red has recently been introduced into some lines to increase genetic diversity, the Buckeye remains a distinctly different breed. In contrast, the Rhode Island Red of today is a much darker in color than the Buckeye and its feathers will be red to the skin. The Rhode Island Red is oblong in shape and appears almost rectangular. It is a lighter bird, less stocky than the Buckeye. The Rhode Island Red has a single or rose comb. 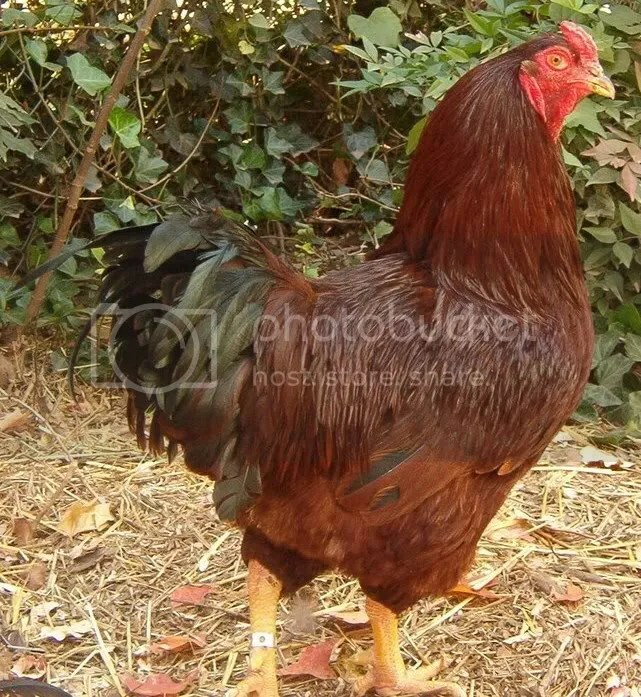 The Buckeye is considered a very rare heritage breed chicken. Without the collaborative efforts of a few long-time breeders and the American Livestock Breeds Conservancy (ALBC), the Buckeye might well have gone extinct. With the ALBC recent program to help recover the Buckeye and new found enthusiasm among Buckeye breeders, the breed is endearing itself to a new generation and making a comeback. There are no other varieties except the deep mahogany bay color. The Buckeye does also come in a Bantam size. For anyone interested in Buckeyes and wishing to become more involved, join our Buckeye Discussion Group to learn more.